I try to avoid getting stuck in low market share software platforms because whatever benefits they might have, eventually the lack of third-party apps, plugins, and utilities becomes too frustrating, and almost inevitably generates a death spiral as the lack of development reduces market share further, which means even less external support, and so on. I learned this lesson 20+ years ago running OS/2, an IBM/Microsoft joint-venture superior alternative to Windows that Microsoft abandoned and then killed. I ended up using Aperture by mistake. I was not heavily involved in photography and just wanted something more powerful than iPhoto but less expensive than Photoshop. I did not even know about Lightroom or the fundamental ways that Aperture differed from Photoshop and couldn’t really replace it. And when I started getting serious about photography I fell in love with the program before I had any clue it was OS/2 all over again. Yesterday Apple finally announced that it was officially halting development of Aperture (and iPhoto) in favor of a new Photos app that will debut next year as part of the next version of the Mac OS called Yosemite. I’m disappointed, but the purpose of this article is to work through my path forward, not complain about what I wish would happen. Most Aperture users will see that we have two main options, one of which is still shrouded in uncertainty: (1) switch to Lightroom, or (2) transition to Photos in 2015. Yes there are other photo management and editing options available, and some of them might be excellent, but they all fall into the OS/2-Aperture trap of a small user base, limited third-party support, and the constant fear of discontinuance. If you choose one and are happy that’s wonderful but it is not for me. Most remaining Aperture users have considered switching anyway. Some, like me, already own Lightroom (especially with the Creative Cloud Photographers option) and have given it a try. 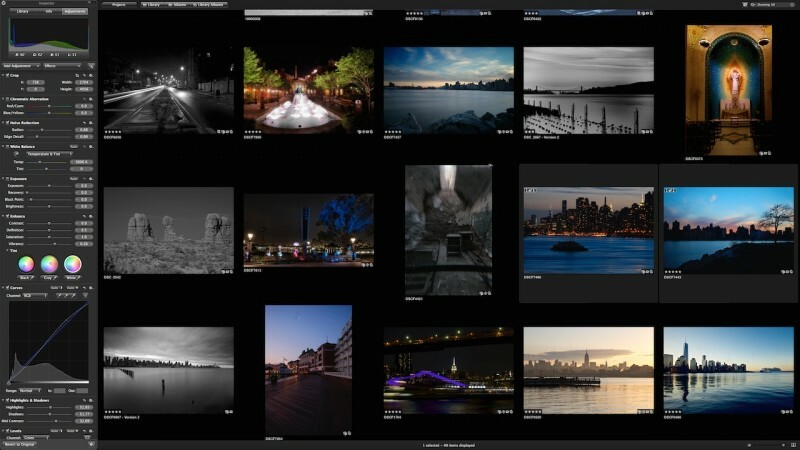 I am fairly familiar with Lightroom and stayed with Aperture because I preferred it, mostly for the organizational tools and a few superior editing tools. Be that as it may, I can work in Lightroom if I must, and I recognize it has several features that Aperture lacks, including lens corrections and gradients, and does others better, such as noise reduction. But if you plan to move to Lightroom now you should wait. I will explain why in a moment, but trust me, there is hardly any worthwhile counterargument at this point. The problem with this option is that nobody knows exactly what features Photos will have, and which key Aperture features will be dropped. Some expect a decidedly consumer oriented app that will leave power users thoroughly disappointed. Others are hoping for an application that is rich enough for pros or at least prosumers, while having a surface simplicity for consumers. Others expect something like the Final Cut Pro X rollout, in which the initial product leaves most professional level users floundering due to a complete loss of necessary features (plus a complete change in workflow that requires retraining) but that improves over time into a superb product. I will not even pretend to have a reasonable ability to predict what will happen. The complete workflow change is possibly what I fear the most because organization and workflow are exactly what Aperture excels at and the main reason I never switched to Lightroom. But if you want to give Photos a chance, you will of course have to wait until it and the new Mac OS are released next year. And given that so many Aperture users suspect that Photos will be inadequate for their needs, why not just switch to Lightroom now to get the headache done and over with as soon as possible? All of your Aperture Edits. Yes. All of them. Exposure, Definition, Saturation, Curves, Highlights/Shadows, Contrast, Colors, Levels, White Balance etc. Gone. Again, we do not know if the migration assistance help will save any or all of these things, but you will undoubtedly lose them if you move yourself now. Meanwhile, Apple has also announced that it will provide one or more pure compatibility updates to Aperture to ensure that it works in Yosemite (see the same TechCrunch article linked above). Whether it will work in the OS version after Yosemite is unknown, but it is safe to believe that a total loss of functionality is not imminent. In addition, if you let Aperture fully manage your library* including the storing of images, then Lightroom probably cannot even see them until you manually export them out of the special library package file where Aperture stores them. There is reason to hope, at least, that the migration assistance will simplify this process. Moreover, Apple provides RAW conversion support directly at the OS level, so there is no reason to expect that you will not receive RAW updates for any new cameras released in the next year or so at least. * If you already manage your own image locations this should not be a headache for you. One thing I am quite certain of is that if and when I switch I will manually export both a JPG and either a PSD or TIFF file of every single “finished” image in my library so that at the least I can generate new copies for print or distribution with exactly the edits that are baked into each image right now. It simply makes no sense to transition your existing libraries from Aperture to Lightroom now, and not before the migration assistance is offered (or if it is announced that it was vaporware all along, which I doubt). If you want to start importing new projects into Lightroom, that could make sense, but it is also a pain to have to switch between two programs for different projects. I think it just makes the muscle memory and intuitive workflow process confused. At a minimum, you should wait until the migration process from Aperture to Lightroom is officially announced and available from Apple and/or Adobe. Depending on when that arrives, it might then make sense to continue waiting a bit more to see if Photos works for you. I suspect it will not be sufficient for me, but I could be wrong, and even if I am right it could still work and even excel for other photographers. In fact, because of the promised Aperture —> Lightroom migration assistance, the people I feel most sorry for in light of yesterday’s news are those Aperture users who grew tired of waiting for a major update and who manually switched to Lightroom in the last year. I’m not sure if that’s sour grapes, Pollyanna-ish, or making lemonade out of lemons, but I think it’s true. Those of us who hung on and, and who continue to wait, should have it easier. well thought out Mark – as an Aperture user myself, I have often wondered if I was missing out not using LR but I don’t really think so – now, I may have to move but have also thought that since they mention an upgrade/migration path, that I could get some help in the move, b/c all those files would take me forever – great seeing you last week and shooting NYC, will let you know when I can return!